It’s four defeats on the bounce for Burnley after yesterday’s 1-0 loss against Wolves, following those against Watford, Fulham and Manchester United, and this latest one, which was followed by West Ham’s win at Everton has dumped us on the bottom of the Premier League. This has not been the start to the season we hoped for; it’s probably not been the one we expected, but the reality of the situation is that all of the other teams are now above us and the battle to get out of that danger zone has to start right now. The record books will show that this was the narrowest of the four defeats to date. We lost by two clear goals in the other three but this time the loss was by the narrowest of margins, just the one goal. Quite how I will never know, and Wolves will have to be asking questions of themselves as to just how they only managed to score once from the ridiculous number of good opportunities presented to them. Sean Dyche opted for a 4-4-2 formation. Out went Ashley Westwood and Chris Wood and in came Sam Vokes and Ashley Barnes. In the other change, Jόhann Berg Guðmundsson, as expected, returned from injury at the expense of Dwight McNeil who, somewhat surprisingly, didn’t even make the bench. Wolves are currently like we used to be; they have not made a solitary team change yet this season. With some of our group giving this one a miss I opted for the train yesterday. The journey both ways was fine but that was about the only real positive I can report. A few years ago, ahead of a game at Molineux, Wolves supporter Denise Butler was injured when a firework hit her in the face. It should have gone up vertically as the teams came out but flew into the Billy Wright Stand. I wonder what Denise and Moxey would have made of the display yesterday when the teams came onto the pitch. Sensibly they were on the opposite side to the players but I have to say that I’ve never witnessed anything quite like it in a football ground. There could have been a very serious incident had just one of those fireworks misdirected. As for the game, Wolves started on the front foot and we certainly had some defending to do, but we were doing it well enough certainly in the opening period of the game. We even had one or two situations ourselves with Vokes certainly warranting his recall with some good work. He won headers and held the ball up well but too often there was no one getting close to him with Barnes almost anonymous. Not for one minute do I think Wolves weren’t the better of the two sides but they hadn’t really created too much and we looked reasonably comfortable. But then, that all changed. In a short spell we were grateful to James Tarkowski and, in particular, Joe Hart for keeping us level. Hart made two or three good saves, one of them from the top drawer, while Tarkowski twice cleared off the line. It lifted Wolves and from that moment on this was no contest other than for the next half hour or so we kept the scores level. At half time, and with the score 0-0, I did think we could maybe get something from the game. We needed to regain our composure, particularly in the wide areas where Wolves were beginning to run amok but there was still something in it for us. There nearly wasn’t just two minutes into the half when Bardsley gave the ball away. How on earth Wolves didn’t score only they will know but it kicked off a pattern for the second half in which they missed chance after chance. We constantly gave the ball away under no pressure whatsoever and the home side found they could have total control down their right where Charlie Taylor and Aaron Lennon were having absolute nightmares. Dyche replaced the ineffective Barnes with Matěj Vydra early in the second half but he hadn’t been on long when Wolves went in front. Finally Raul Jiménez managed to find the target; only just though, via the post. But the way the game was going you just almost accepted that this was defeat number four. But at one down there is always a chance. Vydra was very close to equalising with a cross shot that took a deflection and late in the day Guðmundsson fired a free kick just wide. That was virtually our last chance although the same player should have done better with a shot from the edge of the box, but either side of them we continued to live a charmed life as Wolves created what seemed to be chance after chance after chance. They didn’t take any of them and had to settle for 1-0; we simply had to be relieved we got off the pitch with only a 1-0 defeat. This could have been a frightening scoreline, even worse than the 4-0 defeats we suffered at West Brom. Had it been six or seven we could really have had no complaints and I would think Nuno Espirito Santos will have his team on shooting practice this week. As for us, it’s not desperate, far from it with 33 games still remaining. But it’s not good and there seem to be very few, if any, positive signs right now. It’s not just this season though. Remember our manager being the proudest man in Proudsville after we’d beaten Stoke last December to go fourth? Since then we’ve won just 24 Premier League points from 26 games and 15 of those came in a run of five successive wins, the only occasions we’ve picked up three points. Injuries don’t help. We’ve been without Robbie Brady for all of those games; Steven Defour has been missing since January. The sooner they are back and fully fit the better we’ll be but it’s not just that. Dyche has spoken far too often really about the last transfer window and how he wanted more players in. We got just three. Vydra doesn’t start, Gibson is injured but wouldn’t have started and Hart wouldn’t even be here but for a drastic goalkeeper shortage back in July. We clearly got this window wrong. The chairman always boasts when a window closes as to how we’ve come out of it stronger than we went in. Has he said anything this time? I’m always disappointed when we lose; this time I’m seriously concerned. We need to find a way of winning, we need to find a way of picking up points. The sooner the better because we cannot carry on playing as we did yesterday. The last hour of that game was frightening. Positives? Hart, Tarkowski, Ben Mee and Vokes, and I thought the referee was excellent. 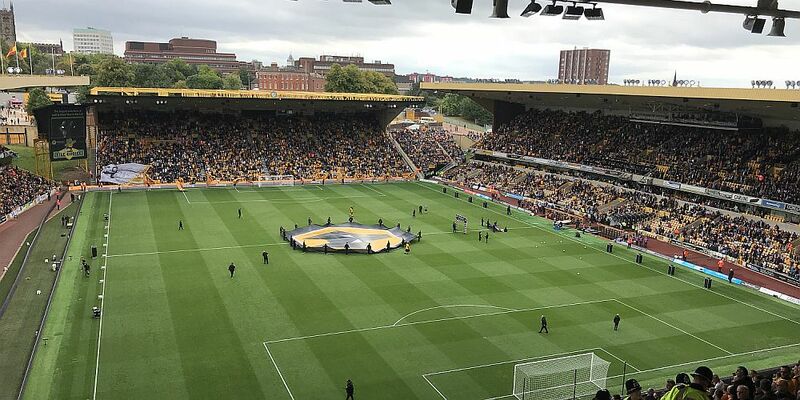 Wolves: Rui Patrício, Matt Doherty, Ryan Bennett, Conor Coady, Willy Boly, Jonny Otto, Ruben Neves, Joao Moutinho, Hélda Costa (Adama Traore 66), Diogo Jota (Morgan Gibbs-White 88), Raúl Jiménez (Leo Bonatini 76). Subs not used: John Ruddy, Kourtney Hause, Romain Saiss, Ruben Vinagre. Yellow Cards: Diogo Jota, Ruben Neves. Burnley: Joe Hart, Phil Bardsley, James Tarkowski, Ben Mee, Charlie Taylor, Aaron Lennon, Jack Cork, Jeff Hendrick (Ashley Westwood 79), Jόhann Berg Guðmundsson, Sam Vokes (Chris Wood 70), Ashley Barnes (Matěj Vydra 56). Subs not used: Tom Heaton, Matt Lowton, Kevin Long, Stephen Ward. Yellow Cards: Phil Bardsley, Jack Cork, Jόhann Berg Guðmundsson, Charlie Taylor.